Sometimes we really wonder…with her tail curled in a perfect S-shape, head angled just a liiiittle to the right, and paws frozen in stance, our Kitty McKitterson seems to know when a camera is around. Does she know we’re snapping a photo of her? She must! Interesting then that she’s so choosy about when she wants to have her photo taken. Sometimes we think she’s spiting us for not letting her have a bite of our cheezburger! 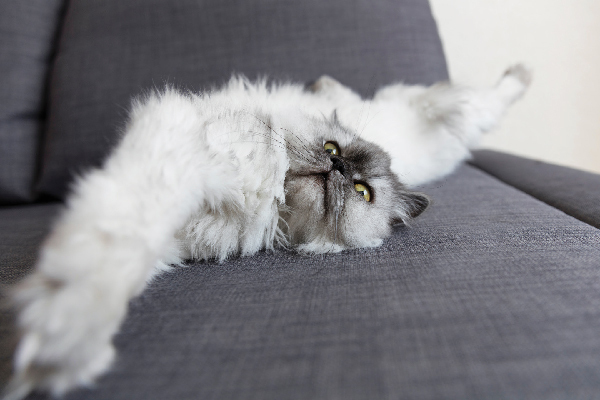 While we wait for our kitty to feel a little more camera ready, we’re going to capture all of her furniture-leaping, whisker-whisking, cat-napping charm with these handy bribes, er, tips! Ahhh, the treat trick (by treat, this can also be catnip, or a favorite toy). Nothing like some good old fashioned bribery to get your kitty to do what you want. Sounds easy enough, but trust us when we say there’s more to it than just waving a treat around. 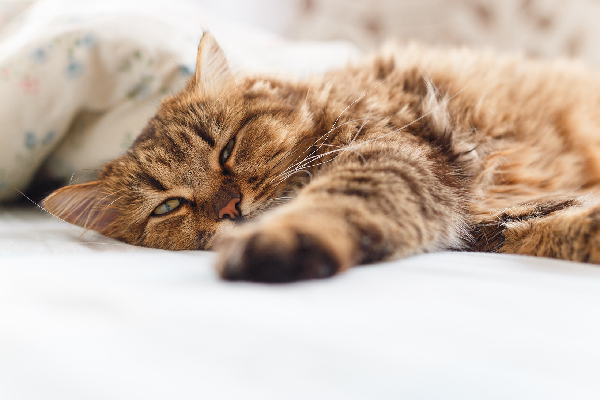 Sweeten your feline up first by giving him/her a few treats – comfortable and happy is the goal! Once they know you have the treats and that you’re freely giving them out, keep them in your hand and near your camera while you start to photograph. Another option is taping the treat to the top of your camera.This way his/her eyes will always be towards the lens! Set up obstacles that you know your cat won’t be able to resist. Stand by to take photos! We like to call these cat photo traps (not to be confused with the equally cool National Geographic photo traps). Is there something your little meower can’t resist? Unraveling toilet paper rolls? An oh-so-inviting open window? Empty cardboard boxes? An open bag of kitty snacks conspicuously positioned on the counter? These are all ways to lure your kitty out for some funny action shots! Tailor it to your cat’s quirks. Ex: Ours loves to jump out the window. So, we open it just a crack. She’ll linger around the window and try to get through but can’t totally since it’s not opened all the way. The obstacle gives us time to take plenty of adorable pics of her peeking through! Set up a photo trap with an obstacle or a goodie you know your cat can’t resist. Here we set up our camera with a Gorillapod and an open bag of cat food! Here’s an easy one: simple backgrounds. They make for great photos! A simple, stuff-free background brings all the attention to your feline. A blank wall, background, blanket – get your kitty in front of one of these. Colorful rugs, blankets, and toys are the perfect way to brighten up the photo and will make your subject (aka Kitty McKitterson) pop all the more. Simple and colorful backgrounds make your kitties the center of attention! 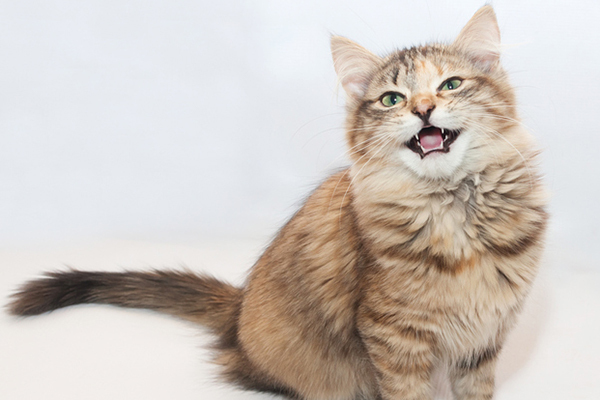 There are three methods to candid photos of your feline friend. They work best when not used with flash since flash will grab their attention. If you’re indoors, instead of flash, set your camera on high ISO, sports mode, or any mode that lets you take photos in low-light conditions. Sneak attack – Take your shoes off, get in stealth mode, and sneak up on your kitty. We keep our camera held up to our face while we do this, so as not to startle her with any sudden movements (i.e. bringing our camera up to our face). This one’s the most difficult since cats have such a keen sense of hearing. Zoom – Have zoom on your camera? Use it! This way you can stand far away from your cat and capture that adorable shot without distracting ’em. 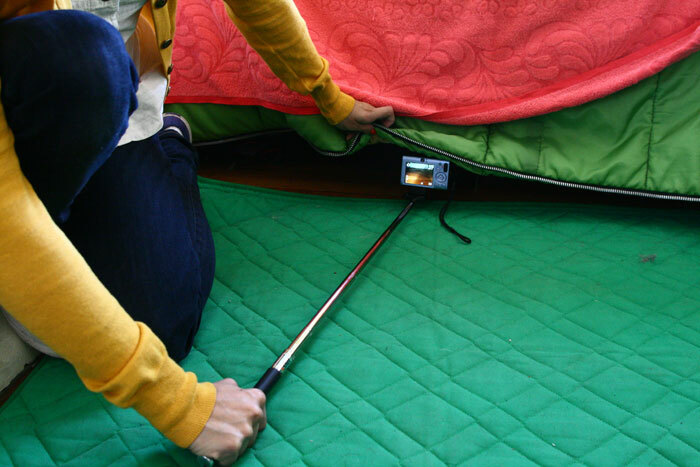 The Camera Extender – The camera extender is a hand-held extendable pole on which you can mount your digital camera (works best with point and shoots). We like to use this one to peek our camera around corners, under beds and cars, and up high on bookshelves and fridges where we can’t reach our kitty. It lets us capture our kitterson without her knowing we’re taking a photo. It’s kind of like sending out a drone to bring back photos from beyond! This is a fun kitty project our pal Sarah tried out with her housemate’s kitties. They turned a play session into a photo shoot! They used toys that get their cats jumping in the air (you can use toys attached to a pole that bounce around). While one of them enticed the kitties to jump, the other snapped lots of photos with flash. This is one instance when flash is good! Your cat isn’t looking straight at the camera, so it won’t be as bothered by the bright light, and the flash will capture your kitty in all sorts of amazing mid-air positions. 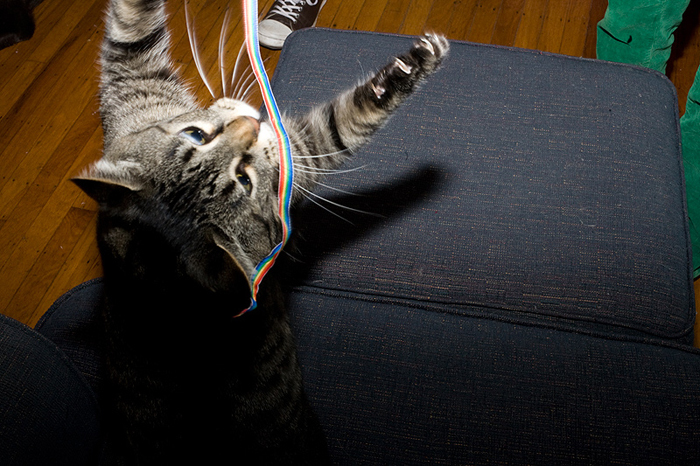 Get pics of your cat in action with a toy and flash! All those photos you have of your favorite feline from above are lovely, but you’re probably tired of seeing your feet in all of your shots. Get down to your kitty’s eye level. Chances are he/she’ll be less distracted by you hovering from above and if you sit at their level long enough, they will start to get more comfy with you and your camera. 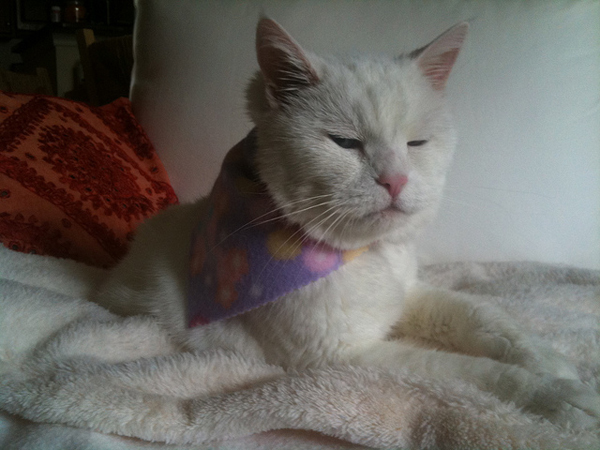 Getting on his/her level also softens the master/follower hierarchy – now, you see your kitty as an equal! Get on eye-level with your kitty. Sometimes that means getting under furniture or reaching up high. The Camera Extender’s pretty handy with that! Wait ’til after a major play session to start your photo session; they’ll be in a more relaxed and comfortable mood. 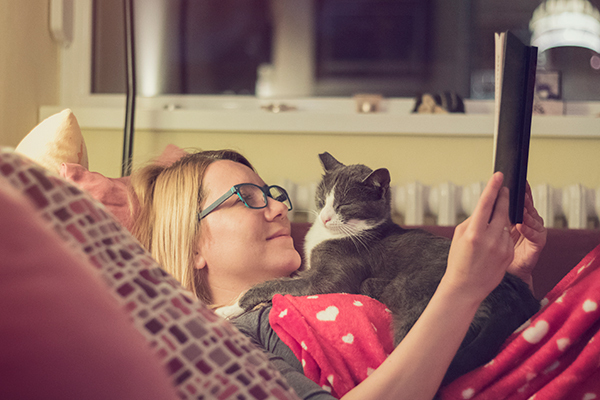 They’ll feel safe and cozy, and chances are you’ll get some great pics of your cat lounging or sleeping! 8. Prepare to shoot on a special occasions! Baths, visits with other animal friends, visits to Ikea, Office Space re-enactments, cheezburger feasts. You get the picture. Have you heard of Doggie Cam? It’s great for cats too. 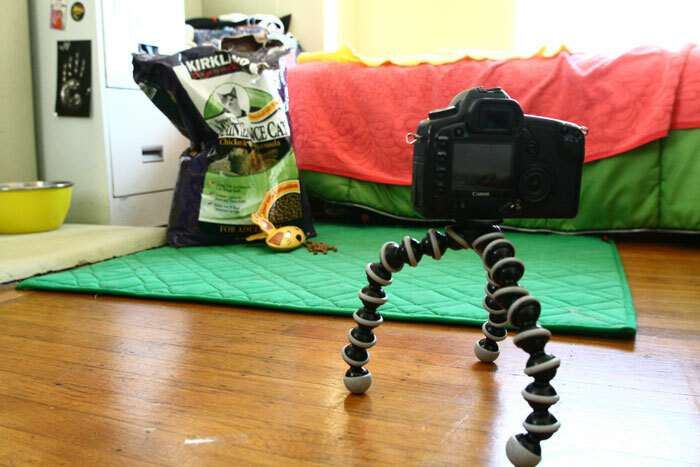 You can use a Gorillapod (a bendy tripod) to attach a camera to your pet. Wrap the ‘pod around your kitty’s collar, turn the camera on video mode (or set the photo timer) and see where he goes and what he does! Don’t use too much flash: This will eventually bother your feline, and it’ll make their eyes look funky. Shoot in daylight or use high ISO, sports mode, and any low-light setting if you need to! Don’t have a nonstop photo session. Let them have a break! Mix play in. Don’t think you need a fancy camera. Point and shoots can do wonders! Don’t suddenly throw a camera in your gato’s face. Let them get used to the camera. And there you have it! 10 tips for getting great photos of your kitty. Mix play with photos, and you’re in for a photo session that will keep your cat happy, too! 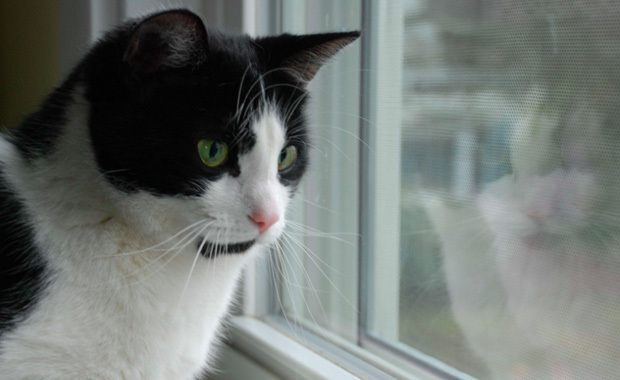 This article was written for Catster by Photojojo, an insanely great photo newsletter. It’s chock full of original DIY projects and tips that pretty much anyone can do! You’ll also find the raddest, most neat-o-est goodies in the Photojojo Shop.